When you think of the word “trend,” what images come to mind? If you went to high school in the 80s, perhaps you see visions of blue eye shadow and big hair. Or, maybe you associate the word with fashion. The truth is that trends affect every aspect of our existence, not just those that are superficial. There are trends in language, cuisine, music, art, and politics. Trends exist in nearly every industry imaginable—especially the eLearning industry—and they directly impact corporations and businesses. Because eLearning and corporate learning are often so interwoven, online learning trends shape the arena of corporate learning in particular. Some eLearning trends may be negatively affecting corporate learning, but many are making a positive impact on the way corporations train their employees. Employee development – Employee development, corporate learning, and online learning have a lot in common. Corporate learning develops employees by making them more skilled and competitive. Corporations build their employees through the training they offer them, and much of that training is delivered via online learning or learning management system (LMS). Through online learning, companies are effectively developing workers that can meet their needs and help them grow. Thanks to eLearning, the skill level of the average employee will steadily increase as time goes by. Would you agree that this trend is beneficial to corporations? Online learning platforms such allow companies to offer personalized training to their employees. This can increase knowledge retention and training transfer. Individualized learning via online platform is a great example of an online learning trend that is impacting corporate learning for the better. Mobile learning – Mobile learning is a feature common to social learning management systems. It has a convenience factor that is irresistible and irreplaceable in the corporate world. LMS developers and providers understand that individuals rely on mobile learning in order to fulfill their employers’ training requirements. Not only does mobile learning give learners the ability to log into online courses 24/7; it also allows them to access those courses from almost any device with an Internet connection and a Web browser. Convenience is king in today’s workplace, and mobile learning rolls out the red carpet. Big data – Big data has become a big trend in online learning. In the context of online learning, big data refers to “the data that is created by learners while they are taking an eLearning course or training module,” wrote Christopher Pappas in his article Big Data in eLearning: The Future of eLearning Industry. He remarked, “There are a number of reasons why big data may, very well, revolutionize the eLearning industry. First and foremost, it will allow eLearning Professionals to customize the eLearning experience to provide learners with more effective, engaging, and informative eLearning courses and modules.” Combine this with the eLearning trend of personalized learning and you have a recipe for large amounts of information retention. The big data trend in online learning is positively affecting corporate learning by giving organizations excellent learner feedback. This helps companies develop better corporate learning programs that train workers thoroughly, quickly, and effectively. Big data in online learning is yet another example of an eLearning trend gone right. Trends are a part of life, and they rise and fall like ocean waves. However, some trends have such positive and far-reaching effects that they ultimately become necessities. The employee development, individualized learning, mobile learning, and big data trends in eLearning are becoming essential to companies. In this process, they are shaping the future of corporate learning into something beautiful. 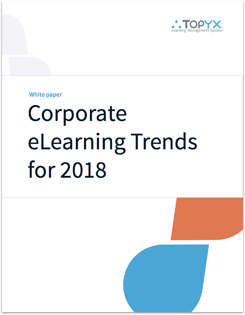 We've created a free White paper analyzing the top trends impacting corporate eLearning in 2018.